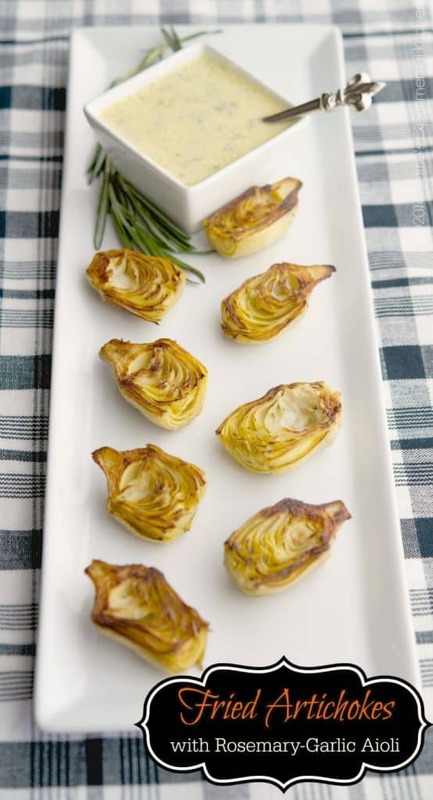 Fried artichoke hearts with rosemary garlic aioli is a deliciously light and flavorful appetizer that’s perfect for Springtime or holiday gatherings. A few weeks ago, we went out to dinner with my in-laws to celebrate my MIL birthday. The restaurant was named Grato, and they had Fried Artichokes on their appetizer menu. They sounded so good and different so we ordered them and they did not disappoint. I like to try to replicate dishes that I’ve enjoyed out at home as soon as I can so that the flavor is still etched in my mind and I have something to compare it to. I’ve seen recipes where they use the fresh, whole baby artichokes, but it seemed like such a waste as you have to peel away so many leaves in order to get to the softer petals. 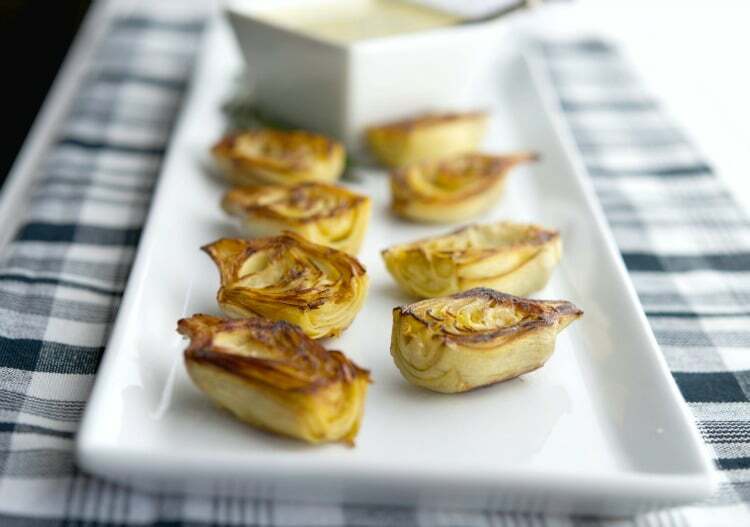 These Fried Artichokes with Rosemary-Garlic Aioli were delicious and so easy to make. If you have a deep fryer, you can use that as well, but I wanted to limit the amount of oil used in this dish as much as possible. 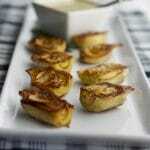 The Rosemary-Garlic Aioli also gave these fried artichokes so much added flavor. They are now a new favorite and I’m sure I’ll be making them again very soon! ~Enjoy! Cut the artichokes in half vertically down the center and drain on paper towels to remove the moisture. Heat oil in a large,nonstick saute pan over medium high heat; then place the artichokes in the oil. Fry 3-4 minutes per side until they have browned slightly. Remove from oil and drain. Add the garlic, mayonnaise, oil and rosemary to a mini food chopper or blender and pulse until thick and creamy. *Nutritional information provided by Calorie Count and may not be 100% accurate. Serving size for this recipe shows the nutritional information per half of artichoke so that you can determine your own portion size. It also uses all of the aioli.